Port of Trieste, December 10th, 1917 is a foggy night. Anchored in the bay of Muggia there are two coastal defense ships, the Wien and the Budapest. Both battleships had been used to bomb Italian coastal defenses at Cortellazzo, near the mouth of the river Piave, backing up the attacks of the Austrian-Hungarian army after the breach of Caporetto – Kobarid. Despite its limited success, this operation had caused an immediate reaction from the Italian: the two, old Austrian-Hungarian ships had to be sunken because they represented a threat for the new Italian defense line along the Piave. But all previous air raids had proven inefficacious, and only caused slight damages to battleship Wien. The only solution is attacking the ships while they are anchored in the Bay of Muggia with torpedo boats. This operation is nearly impossible: entering the well defended, first Port of Austria-Hungary with two MAS torpedo boats, eluding all of its defenses. For three weeks, during the night, Italian patrols carefully inspect the Gulf of Trieste, reviewing the defenses of the port in the Bay of Muggia, where the two Austrian-Hungarian ships are anchored. The Italians study the barriers near the breakwaters, the position and use of searchlights, and the patrol schedules of the armed launches. In early December the operation is ready. 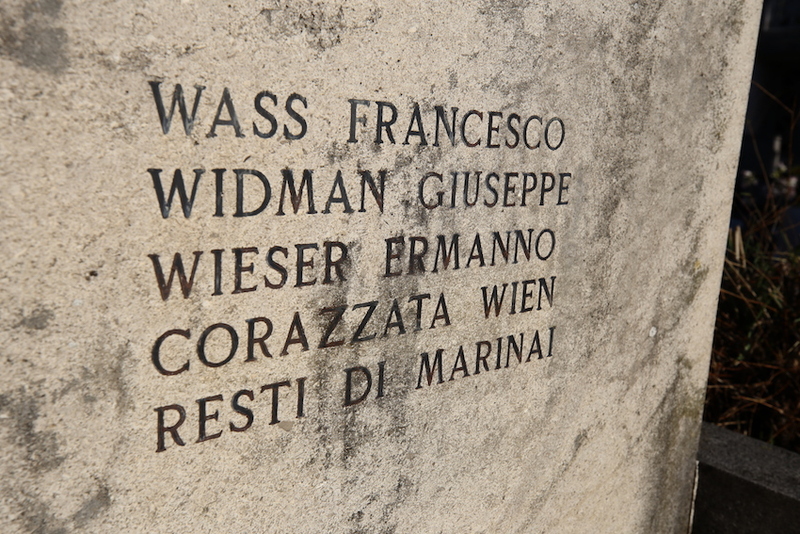 The attack is entrusted to the MAS 9 torpedo boat of Under-lieutenant Commander (sottotenente di vascello) Luigi Rizzo and to the MAS 13 of Under-lieutenant Commander Andrea Ferrarini. Both torpedo boats depart Venice in the late afternoon of 9 December, towed by destroyer 9PN and by destroyer 11PN. Five hours later, as they approach the Port of Trieste, the two MAS torpedo boats leave the destroyers and at 11.55PM, powered by their silent electric motors, the MAS torpedo boats get close to the main breakwater in the bay of Muggia. The breakwater is undefended, and the searchlights in the bay are shout: the perfect conditions to attack. The two MAS torpedo boats must now find a way between the seven defense lines made of metal cables that support the barriers. All nets are cut, one after another using special hydropneumatic shears, and the barriers are lowered. Only one of the searchlights that defend the port lightens the bay from one side to the other, yet, without finding any of the two Italian units. After two hours of work the MAS torpedo boats have entered the port, twenty minutes later they identify the silhouette of the two Austrian ships. At 2.32AM the torpedoes are launched: MAS 9 attacks the Wien and MAS 11 attacks the Budapest. The torpedoes of MAS 11 miss the Budapest, and explode on firm land, hitting the dock in front of the naval aviation, while those launched by MAS 9 hit the Wien: being hit at the frontal right engine room, it tilts starboard and quickly takes in lots of water. It is only at this point that the defenses of the port of Trieste are alerted, and all searchlights are lit, illuminating the bay of Muggia to find the Italia torpedo boats, but it is too late: both Italian MAS reach the exit and disappear, reaching the destroyers that tow them away. The commander of the Wien, Fregattenkapitän von Scheibenhain, immediately orders to fill the balancing tanks, but it’s too late: inexplicably, the watertight doors had remained open and the ship, hit by a deadly blow, sinks in only a few minutes together with 46 sailors at 16 meters of depth. The tragedy has happened: the audacity of the Italian attacks and the negligence of Austrian-Hungarian defenses cause the harshest snub that the K.u.K. Kriegsmarine had suffered yet in the war. Unfortunately, the sinking of the Wien will prove a premonition of what will be the last year of existence of the K.u.K. Kriegsmarine itself. Battleship Wien was a “Monarch” class ship; built at the Stabilimento Tecnico Triestino – STT (Technical Establishment of Trieste) in Muggia between 1893 and 1897, it represented the first attempt to provide the Imperial-Royal navy with powerful battleships as part of that fast transofrmation of the navy that took place at the beginning of the 20th Century. The three battleships, designed by architect Siegfried Popper, inventor of all main naval units of the K.u.K Kriegsmarine, served for coastal defense but were no match with the much more modern enemy naval units. Their limits were limited speed (17 knots at maximum), scarce range (3.500 nautical miles at 9 knots speed), and an armament consisting in only 4 240 mm guns placed in two twin revolving turrets and 150 mm guns on the sides (three on each side). Similar armaments were not suitable to the rapidity of fire needed in modern naval battles: instead, they were suitable to bomb the coasts. And indeed, this was the main task of Monarch class ships in World War I. Reserve naval units regarded as “decrepit boats”, back into service but with limited duties. After all, what else should 97-meters long ships do, considering their displacement amounted to just 5.600 tonnages, making them a “hybrid” between a monitor ship and a cruise ship? Another weak point was their limited speed in case of enemy attack when the ships were anchored: it took six hours to pressure the boilers, and this made it incredibly vulnerable, making it necessary setting a specific defense, as proved by the very sinking that occurred in the bay of Muggia.